Contribute to Help Team United go Over The Edge for United Way of Southeast Missouri! Provides 8-10 hygiene kits for the homeless or food for the weekend to 6 students. Donates a full set of books to Read to Succeed, a literacy program for struggling young readers. Provides one week of food and toiletries for a family recovering from a disaster. EVERY $100 GIVES YOU ACCESS TO THE CHICKEN COOP FOR FREE REFRESHMENTS AND RAFFLES ON EVENT DAY! Gives one child a full year of safe after-school enrichment. Delivers a hot meal to 20 senior citizens for a week. Assists with transportation, childcare, parent education, and workforce training to a newly employed parent moving toward self-sufficiency. 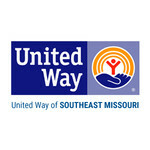 United Way of Southeast Missouri requests some further information. United Way of Southeast Missouri is managing the funds for this campaign.